Make this DIY Solar Eclipse Viewer using supplies you have around the house. And then, on Aug. 21, 2017 you can view the eclipse safely with your family. When I found out that there is going to be a total solar eclipse across the United States, I got so excited! A total solar eclipse across the United States doesn’t happen very often. The last one was February 26, 1979. So, you don’t want to miss this one! Can you see why I’m so excited?! I remember seeing a partial solar eclipse, when I was a kid. And that was awesome! So, I can only imagine this! A solar eclipse happens when the moon comes between the Sun and Earth. This causes the moon’s shadow to fall on certain parts of the Earth. Wherever you can see the eclipse, it looks like the Sun went dark and that day turned into night. Not everyone on Earth can see the eclipse. You need a special solar eclipse viewer or a pair of eclipse-viewing glasses to view the eclipse. It is not safe to stare at it directly. It can damage your eyes. My son, loved the video. We ended up watching one about the solar system too. Now, he keeps asking me if the solar eclipse is about to happen. Just so you know, if you’re not in the direct path of the solar eclipse (Oregon to South Carolina), you will only see a partial eclipse (if the weather is clear). It should start around 10:18 a.m. PST. Step 1. Cut the top flaps off the diaper box. Cut a square/rectangle hole in one side of the box. I started at the handle of the diaper box and cut a rectangle. Step 2. Cut a piece of foil slightly larger than the hole to cover the hole. Tape it to the box. Step 3. Cut a piece of white cardstock to fit inside the box (the opposite side of the foil). Step 4. Poke a hole in the center of the foil with a pin. You now have a DIY solar eclipse viewer. You can leave it this way or continue onto the next steps to decorate it. You can have your kids help by having them do the gluing. Step 5. Glue the bright blue paper on one side of the box. I used two sheets. This side is for the bright, sunny sky. We will add a sun coming up in the steps below. Step 6. Glue black paper to the other side of the box (2 sheets). This’ll be the night sky. Glue dark blue paper to the front (which use to be the bottom of the box; 2 sheets). This is where the moon covers the sun. So, the sky is a little darker. Step 7. Glue strips of the bright blue paper around the foil. Step 8. Making the moons: trace your small plate onto the grey cardstock. Stack that piece of paper on top of another grey cardstock. Cut the circle out. You have two moons. Step 9. Glue one moon on the black side of the box. Draw craters with your pencil. Step 10. Glue a u-shape on the other moon and stick it to the dark blue side of the box. We’re creating a pocket. Draw craters on it too. Step 11. Making the suns: trace your cup on yellow cardstock twice. And cut those out. I used a cup that’s small enough that the sun would fit in the moon pocket. Step 12. Lay one yellow circle on your orange cardstock and draw rays (pictured below). Stack it on another piece of orange cardstock and cut the rays out. You have two sets of rays. Then, glue the yellow circles onto the rays. Step 13. Glue one sun on the bright blue cardstock. 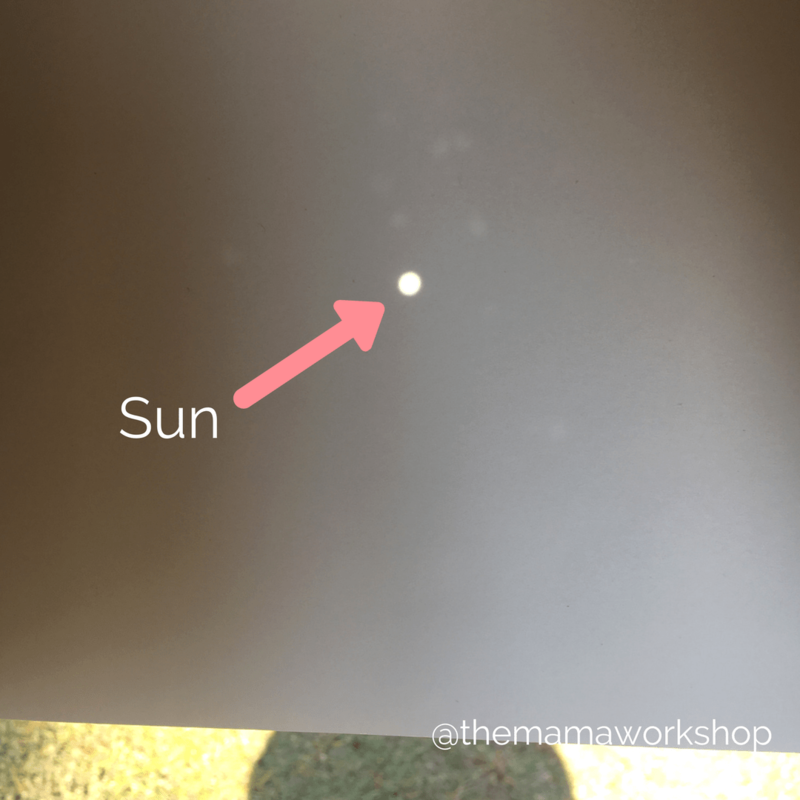 The other sun goes in the moon pocket for your kids to play with! They can take it out and put it back in as many times as they want. And you can say, “That’s a solar eclipse!” Or even review the fun facts with them! Step 14. Now, test out the solar eclipse viewer. Stand with your back to the sun. Hold the box so the sun hits the pin hole. The sun will shine through the pin hole onto the white paper. You will see a little circle of light. When the solar eclipse is happening, you will see part or all of the circle covered. Have fun! Want to do more space activities with your kiddo? Check out 16 Space Activities to Do with Your Preschooler! Made the Solar Eclipse Viewer? Tag us in a pic on Instagram (@themamaworkshop ). We’d love to see all the fun you’re having! I’m just curious… why foil? I’m afraid foil would rip easily. Could I not just use a piece of paper? I’m guessing cardboard might be too thick for the pinhole? Otherwise you would just poke a pinhole in the cardboard, right? Foil is reflective. It acts as a lens focusing the sunlight to create an image of the eclipse onto the white paper. But, you can test out the cardboard before taping or gluing it onto your box. Just, cut it to size, poke a hole, hold it where it would go on the box, stand with your back to the sun and see if the sun image is on the white paper. Let me know if it works. I’d love to put it as an alternative way for readers who don’t have foil handy. Or you can double the foil for it to be more sturdy. I had to hide the viewer from my kiddos because they kept poking at the foil. So, I completely understand your concern of it ripping. I plan to try reinforcing the foil with clear packing tape . Hopefully, the pin will still go through easily. I read somewhere that a 5mm hole works the best at about 2-21/2 feet from the white cardboard. We want to take a video of the eclipse using the pinhole viewer. Maybe the larger box will make that easier. Maybe test it out first by getting a square of cardboard, cutting a square out of the center of it, putting the foil over the square, then the tape and poke the hole. Then, hold that square in one hand and a white paper in front of it with the other. Stand with your back to the sun and see if the sun goes through the pinhole. The tape over the foil may not work, since foil is reflective and acts as a lens. So, testing it first before you make an entire box, would help. If it doesn’t work. Doubling the foil will help make it more durable. Thank you so very much for the great visual steps for making the Eclipse Viewer! I had remembered making them in grade school in 1979 but needed the fine points. It worked great! Thank you for enabling me to view safely (again!) this awesome event! How cool that you saw the last one! I’m so happy to have helped you be able to view today’s eclipse!